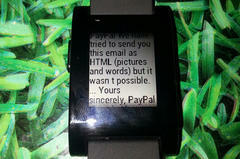 Recently I have noticed that PayPal are sending marketing messages that don't have meaningful text content. This is symptomatic of a wider problem: for marketing reasons people are sending increasingly detailed HTML emails but the text only content - assuming it's even present - is little more than a link to view the HTML content in a web browser. Whilst forcing people to view the HTML might seem like a good idea at face value, there are a number of issues with this approach. Support for HTML emails is, at best, a mixed bag. Whilst most modern email clients have good support there are exceptions to this. I've not had to deal with mail client HTML support for a number of years but I believe that it's still very much a mess. An email without text content is treated as a positive spam indicator by some spam filters. Of course, rather than creating emails that don't resemble spam, you could ask people to add your email address to their "safe senders list" - let me know how you get on with that. By sending emails that don't have a meaningful text content, PayPal are setting up an expectation that genuine emails from them are in HTML format only. A classic phishing technique is to use HTML to mask web links. Given PayPal are already the target of frequent phishing attacks it seems odd that they are choosing to prioritise their marketing message at the expense of their customers. For the widest support and the least risk, the best thing is to send text only emails - that's to say no HTML content at all. However, this is often not politically acceptable so at least make sure that there is a full text content alternative - it's really not that hard! See also: Breakdown of a phishing email which explains some of these issues in more detail within the context of a PayPal phishing email.